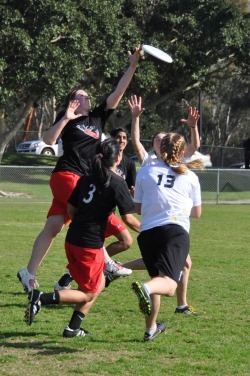 In order to play ultimate for UCSD, you must be a student attending this university (undergraduates and graduates are both eligible) and cannot have been a registered player of the USA Ultimate College Series (the official governing board for ultimate frisbee) at any point prior to 5 years ago. For more information on USA Ultimate eligibility rules check it out here. If you are ineligible to play for UCSD, be sure to check out pick up games in your area as well as league games (usually over the summer and winter) over here. And if you're more serious about playing and have serious skills, check out club teams in the San Diego area! Club season generally runs from May to October, with tryout dates varying between different club teams. If you would like to play for the Men's Team, check out their website here. You're a student and you want to play? Great! Welcome to Psycho Nation. So you've decided to join the frisbee cult, we mean frisbee family, what now? Start off by checking out our practice times, dates, and locations over here. And if you want to know more about ultimate or are unsure about time commitments, email the captains over in the "Contact Us" tab. Let them know you're interested in playing and ask away. Even if you're still unsure about joining, come out anyways and see what ultimate's all about. Bring your friends, meet us in person, and see why ultimate is one of the fastest growing sports in the nation. You never know, this might be the greatest decision you've made in college (it has been for many of us). Maybe you'll be the next MVP. If you don't want to be asking yourself, "What would have happened if I joined ultimate?" then come out to play, the more the merrier. But before you show up to practice, be sure to bring water, a light and dark shirt, cleats (if you have them, running shoes if not, or just any shoes if you have neither), and a readiness to learn one of the greatest underground sports. 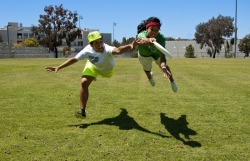 Once you join our frisbee community, you'll get hooked! Woops! Fall quarter's already passed! That's okay! Check out our practice times and email the captains under the "Contact Us" tab to make sure the location and time hasn't changed. Then show up to practice! It's as simple as that. Bring a friend or even five if you'd like. Ultimate runs through all three quarters, with preseason starting during the Fall and playoffs beginning during the Spring. Practices and tournaments are generally held from September to May and it's never too late to join! Interested and it's already May? Perfect! Come out to practice and learn how to play ultimate so you can be ready for the next season. 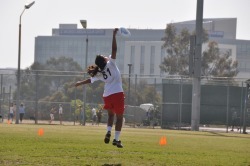 Tons of pick up games, summer leagues and beach leagues hold tournaments, practice, and play throughout the summer and year round so it's never too late to learn how to throw, catch, and layout.